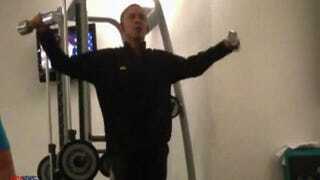 Video and photos of President Barack Obama getting in a workout at a Polish hotel gym have made the rounds on the Internet, but to make one thing absolutely clear, the Secret Service says the president was never in any danger, Fox News reports. According to the news site, a Secret Service spokesman said no one was ever told not to take pictures or video of the president while he worked out at the Warsaw Marriott Hotel gym. "Hotel guests were not asked to leave the gym … nor were they asked to refrain from taking pictures," Ed Donovan said, according to Fox. The agency emphasized that agents were always "in proximity" to the president and that the leaked photos were the same as if the president had stopped by a diner. Facebook user Jean Ekwa snapped the covert footage, showing the president in a dark tracksuit as he went through a series of exercises, including lunges and elliptical training. Ekwa then posted them to his Facebook page, where they, naturally, took off. Obama kicked off his European tour in the Polish capital on Tuesday.